The Friulian plains and the hilly region of Friuli Venezia Guilia are crammed with medieval towns and historic places, with its centre in Udine. The result of the mixing of various cultures and influences over the centuries is exceptional historic and cultural diversity. Udine is a pleasant place to stay, which is also contributed to by its open access to the nearby Adriatic Sea. The city is highly motivated in terms of entrepreneurship and is known for its small- and medium-sized family-run companies, mainly in the textiles, footwear, furniture and food industries. These activities are supported by the Udine Fiere Convention Centre, which manages the fairground and convention centre on the outskirts of Udine and the smaller fairground in Gorizia. Udine is at the crossroads of regions, close to Austria, Slovenia and Croatia, and throughout its history has made full use of its geographical position. The city is a unique mixture of tradition and modernity, Venetian architecture and hi-tech historic conference centres and technology parks. Italians are also principled aestheticians, and those who organise congresses or other events in Udine or Gorizia will find plenty of this. The fairground in Udine is situated beside the city’s main shopping area. The fairground in Gorizia is in a suburban location beside the Soča river. For tourism, and particularly congress tourism, the proximity of Venice airport is a positive. The airport, which is just over 100 kilometres away, is slowly becoming a regional air hub with practically unlimited accessibility. The accessibility via the city’s Ronchi del Legionari airport, which is 44kms from Udine, is also improving. Udine and Gorizia are easy to reach by road, rail and air. The quality of accommodation is at a high level, as befits one of the most economically developed regions of Italy, and public transport in both cities is also good. The only problem is posed by parking at the Gorizia fairground, where the parking area is significantly too small. There is a considerable difference in the architecture style of the fairgrounds. The Gorizia fairground is defined by functional trade fair architecture, which is showing signs of its age. During the migrant crisis there were even tents set up for them at the Gorizia fairground, although this year it seems that both locations have once again come to life. The fairground in Gorizia, however, definitely needs serious investment and modernisation. The fairground in Udine is an entirely difference story, thanks to its functional industrial architecture which appears attractive and more contemporary. It was built on the site of the former Udine cotton mill, the original structure of which dates back to 1884. The large car park and vast green areas contribute to a pleasant atmosphere. You will be especially impressed by the industrial architecture, which is best preserved in Pavilion 9, which dates from 1885. The nicely-kept exterior areas also offer a lot of possibilities and, in our opinion, add value to the fairground. Events at both fairgrounds can be organised either directly or in co-operation with local organisers. The majority are regional and local events for the general public. It is for this reason, perhaps, that expectations are somewhat lower and there is still great room for improvement. This mainly affects the retail part of events, which is hard to avoid, and which spoils the general impression. Such exhibitors disappeared long ago from serious European fairgrounds. The catering facilities are also sub-standard and are reduced to a variety of stands, which have entirely European prices, however, what they offer is very uncompetitive. Therefore, all this combines to feel unprofessional and is reminiscent of former times. Improvisations can be seen and felt throughout. 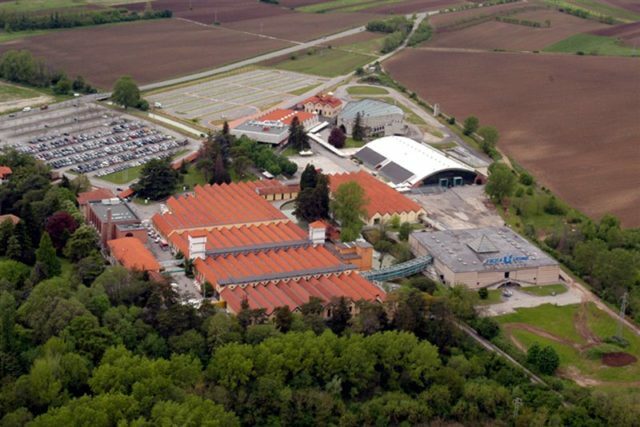 There is a significant difference in the quality of capacities between the fairgrounds in Udine and Gorizia. The fairground in Udine is modernly-equipped and is able to host the most demanding events. The industrial heritage of the 19th century has been excellently incorporated into the trade fair and congress experience. It is a prime example of the remodelling of a former industrial building into a new function on the edge of the city centre. The situation at the Gorizia fairground, however, is an entirely different story. It is in urgent need of renovation and improvement in both quality and capacity. Parking is also a big problem, as is the general first impression upon arrival at the fairground. There is an abundance of hotel capacities in the city and its surroundings. The city and its surroundings are a real shopping paradise. Cuisine is first-class and there are some of Italy’s best restaurants with Michelin stars. History is present throughout the city and creates an excellent scene for various innovative incentive programmes. The well-developed tourist infrastructure is an advantage of the destination. Participants used to ultra-modern German fairgrounds are likely to be fairly disappointed at the trade fair facilities. There is huge room for development, the greatest in terms of the comfort of participants. Some very successful thematic and specialised fairs in the region are becoming more important and are a positive sign for the future of the fairground and congress centre. Wines from the Italian side of Goriška Brda (Collio) and the hilly wine-growing area of the Udine region nicely combine with the region’s cuisine. Participants will enjoy tasting endemic wines which are created by real artists of wine. The key challenge for the destination, which is full of congress surprises, special venues and superb cuisine, is competitiveness within the region. Congress infrastucture is available in Trieste, as well as in Gorizia, Grado and Lignano, and additionally, world-famous Venice is nearby. It is because of this that Udine is perhaps somewhat less recognised than it deserves based on its complete and high quality congress and trade fair infrastructure. This is solid in Udine, however, in Gorizia serious investment is urgently needed. Proactive marketing is also lacking, as its seems that both Udine and Gorizia lie waiting as kinds of hidden gems, which are uncovered by international events organisers who are looking for a slightly more peaceful and quality congress experience.